Thank you to our generous alumni and friends who gave to Emmanuel College throughout the 2017 fiscal year (July 1, 2016–June 30, 2017). Your support provides the College with the flexibility to invest in faculty and staff, enhance academic programs, award more financial aid, strengthen student programs and scholarships, continue making campus improvements and provide more resources to improve the quality of life on campus. This Roll of Honor includes donors who gave between July 1, 2017, and June 30, 2018. Great care was taken to ensure the accuracy of this listing, and we would appreciate your sharing with us any errors or omissions. 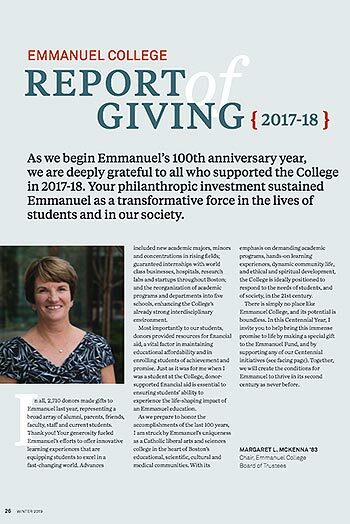 Please direct inquiries to development@emmanuel.edu.